Building A remains standing (left) but towers B-D (right) were gutted by the fire that broke out early Saturday. 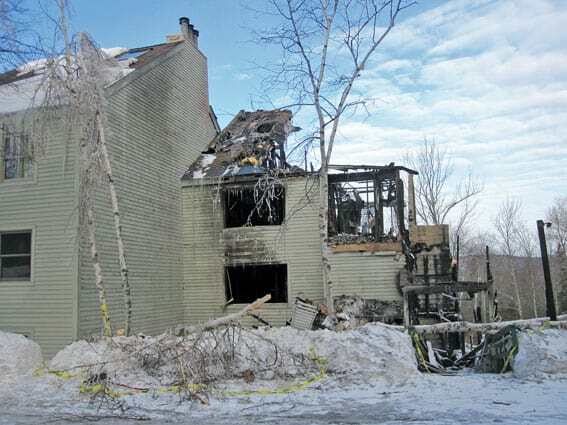 KILLINGTON— Just after midnight Saturday morning, March 7, firefighters from across the region were called to the scene of a major fire at 48 Innsbruck Lane, in Killington. It was the site of 12 of the 16 condos belonging to Killington Townhouses, just south of Peppino’s Restaurant on the lower portion of Killington Road. Multiple witnesses said they first noticed the fire at about 12:30 a.m. and soon thereafter the glow from the fire could be seen from Route 4. All residents escaped safely prior to the fire engulfing the building. “The building was largely made of wood construction, including the framing, and there were no fire breaks between the towers,” said Killington Fire Chief Gary Roth explaining that the fire spread quickly. “There was also no sprinkler system in the building,” he added, saying the building predated the requirement. The department strongly encourages sprinklers for all new construction, but the requirement is only mandated now for commercial structures, Roth explained. Fire crews from Bridgewater, Clarendon, Pittsfield, Plymouth, Proctor, Rutland City, Rutland Town, and West Rutland responded to aid the Killington Fire Department, as did the Killington Police Department and Killington Resort. From early evidence at the scene, “it looked like the fire had started in the chimney but quickly spread to the rest of the structure,” Roth said, adding that the insurance company is in the process of doing a thorough investigation, but that the cause is not thought to be suspicious. In the beginning, firefighters attempted to put the fire out from the inside — what Roth described as an “offensive attack,” but it soon became too dangerous to be in the building as the fire compromised the structure, and the crew was forced to fight the flames from the outside, using tanker shuttles to bring water from the 30,000 gallon tank below the Killington Fire Station. Roth said in total they pumped well over 30,000 gallons onto the structure. Roth estimated that three fire engines were able to pump 2,000-3,000 gallons of water per minute onto the flames. “The supply runs out quick,” at that rate, he said. When they ran out of the available water in the tank below the station, fight fighters had to cut holes in the ice on Summit Pond and draft water from a dry hydrant. Firefighters battled the flames until about 10 a.m. when they were finally contained. There was a small rekindle again Saturday afternoon, Roth said, but 2,000 gallons of water suppressed that quickly. Pressurized hydrants would have helped dramatically with water flow, he said, but to retrofit the town now would cost millions and is unlikely. All new developments, however, are required to put in pressurized hydrants, he said. The Killington Townhouses provided weekly timeshares to over 600 families, said property manager Louis Stevens, who was at the property Tuesday morning. Stevens confirmed that building A was in fairly good condition. “I got water back on in that building yesterday,” he said, adding that they plan to rebuild. Killington Townhouses president Paul Kaufman has not yet set a timeline, he said. It is unknown how many units were occupied at the time the fire started, but during the quick evacuation, many left behind valuable possessions. One family from Canada lost their wallets, phones, passports and all other forms of identification, Killington Police Chief Whit Montgomery reported. “They came to me and I helped document what had happened so they could begin the process of trying to get replacements and get home,” he said. In addition to helping displaced visitors, Montgomery and other officers assisted with traffic control, as Killington Road was closed until about 11:30 Saturday morning. The resort provided extra personnel and electronic signage which helped divert the traffic up West Hill Road. “All entities worked really well together providing mutual aid. The town, resort, citizens and businesses came together to assist the fire department, work crews, and displaced visitors,” Montgomery said.